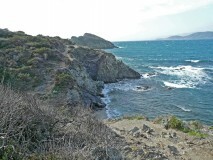 On the western side of the peninsula of Giens lie various hiking paths which go through a nature reserve. 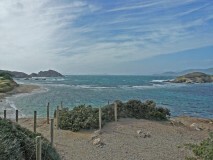 Circling the whole peninsula along the coast takes roughly 4h, a shorter trip through the woods takes approximately 2h. There are possibilities to bathe in the see on the northern side. The route to get to the hike goes through Ste. Maxime, La Foux, Cogolin, La Mole until Hyeres into the direction of the airport and then towards Hyeres Plage. In case of sunny weather and little wind, take the western road to Gien, in case of strong wind take the road going through La Capte. An Alternative is the highway going over Toulon to Hyeres.